✩New SUN-E collections! 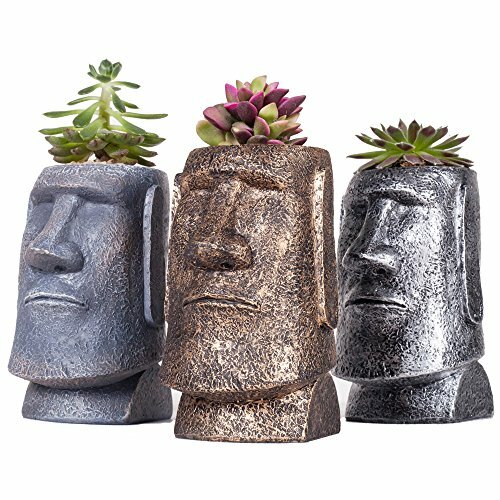 !Easter Island Statue Ideal for adding a dash of refreshingly modern design to your home,Great Gift - this polyresin pot can serve a variety of purposes. Perfect gift for family and friends who love succulent plants with a green thumb or keep it in your own home for a touch of clean, modern style in your living space. ✩The consummate craft,Vivid details,Perfect show the characteristics of the Easter Island Statue,shows you a perfect visual experience,Easter Island Statue lovers,This is going to be your best choice. ✩Material: High Quality Resin;Package content: 3 pcs*Pot.Product Approximate Size: 3 x 2.75 x 4.72 Inch (L x W x H).Planting Approximate Space:2.1 x 1.85 x 2.6 Inch (L x W x H). ✩A simple and sleek contemporary petite Beautifully with elegant, attractive color plant pot.Gardening props, suitable for decorative gardening,desk,bookshelf,dinning table,living room,hosting room and everywhere. Multipurpose,match for Succulent/Cactus plants,small plants even can be a candle holder or a pen pot. ✩Decorations and plants are not included.